Since I own the domain called thepowerofmany.com, I’m thinking about redirecting it somewhere interesting at least through election day. Any suggestions? 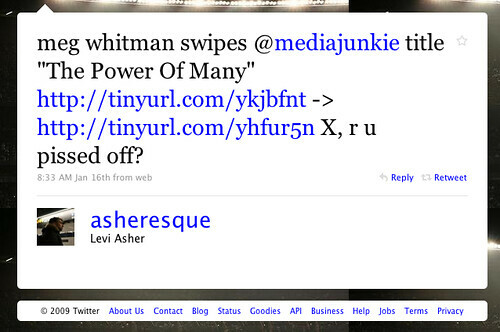 September 28, 2009 · Design, long story short, Patterns, Social Design, The Power of Many, User Experience, Yahoo! designing social interfaces, erin malone, milestones, writing, Design, long story short, Patterns, Social Design, The Power of Many, User Experience, Yahoo! Comments are off for this post. March 31, 2009 · Design, Patterns, Social Design, The Power of Many, User Experience, Yahoo! 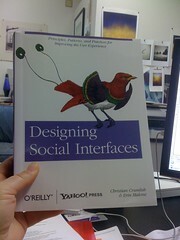 designing social interfaces, done, slides, Design, Patterns, Social Design, The Power of Many, User Experience, Yahoo! Comments are off for this post. March 23, 2009 · conventionology, Design, Events, Information Architecture, Patterns, Social Design, The Power of Many, User Experience, Yahoo!